Welcome to Day #4 of Chocolate and Nibs Theme Week. Today's Organic Dark Chocolate Nib-A-Licious crispy cocoa nibs in 60% chocolate bar was made by The Grenada Chocolate Company (Hermitage, St. Patrick, Grenada). The company's tagline printed on the label for this bar was "The Original Tree-to-Bar Cooperative." A fair claim. The company, founded in 1999,* was a pioneer in organic and sustainable, bean-to-bar production. 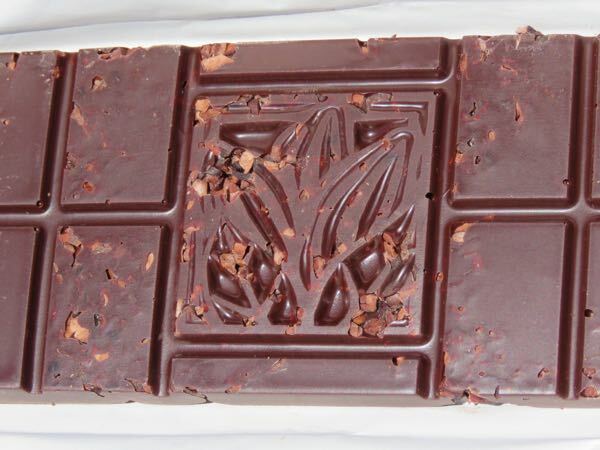 Their chocolate bars serve as a great example of chocolate being made "in-country," this is, manufactured in the same country where the cacao was grown. 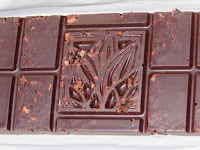 This thick, dairy-, gluten-, and nut-free bar was laden with true chocolate flavor (brownies, fudge) and pleasant cacao fruitiness. Crunchy nibs added extra texture and pure chocolate flavor depth. 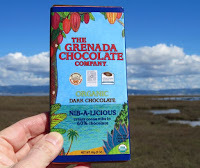 *Mott Green founded The Grenada Chocolate Company in 1999. Unfortunately, Green died in 2013; but, happily for us, and for Green's legacy, the chocolate lives on.